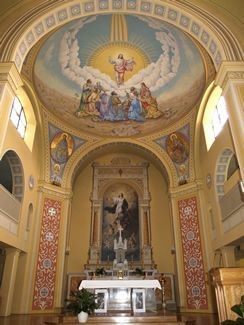 The dome painting featuring the Ascension of our Lord Jesus Christ into heaven and the pillars surrounding the sanctuary. The painting above the back wall altar is an exact copy of Murillo's Assumption of the Blessed Virgin Mary, which was imported from Germany and put into its present position during the remodeling of 1913-1920. 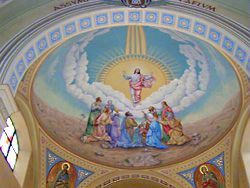 The dome painting in the sanctuary features the Ascension of our Lord Jesus Christ into heaven.